Do your consumers feel knowledgeable about their credit and confident about their personal information? A little knowledge can be powerful, especially when it comes to credit information and identity theft protection. And an informed consumer, armed with key insights about their personal and financial information, is better equipped to create a stronger, more profitable relationship with your institution. By offering Equifax Credit Monitoring and Identity Theft Protection, not only do you allow consumers to learn more about their credit and personal information, but you differentiate yourself from your competitors, drive incremental revenue through your existing consumer base, and enhance your marketing efforts. Credit Monitoring and Identity Protection products are turnkey and standardized for quick deployment. We offer two types of plans for your business. In the Partner-Paid plan, your business pays for the products and distributes them with promotional codes, allowing you to offer them free of charge to your consumers. In the Consumer-Paid plan, your business provides consumers with a URL they can use to access the online products, which they can purchase at a discount. One-time reports include an Equifax credit score1 and report, or an Equifax 3-bureau credit report and score. A real-time snapshot of their credit profile, one-time reports show consumers what’s happening now. 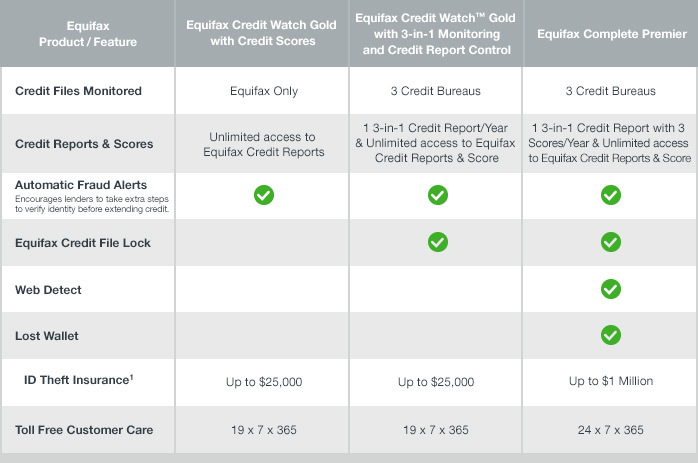 Monthly subscription options include Equifax Credit Watch Gold with Credit Scores, Equifax Credit Watch Gold with 3-in-one monitoring and Credit Report Control and Equifax Complete Premiere. Monthly subscription products allow consumers to monitor credit information over time, alerting them to key changes and providing insights into how behaviors influence credit. 1.The credit scores provided under the offers described here use the Equifax Credit Score, which is a proprietary credit model developed by Equifax. The Equifax Credit Score and 3-bureau scores are each based on the Equifax Credit Score model, but calculated using the information in your Equifax, Experian and TransUnion credit files. The Equifax Credit Score is intended for your own educational use. It is also commercially available to third parties along with numerous other credit scores and models in the marketplace. Please keep in mind third parties are likely to use a different score when evaluating your creditworthiness. Also, third parties will take into consideration items other than your credit score or information found in your credit file, such as your income. 1Identity theft insurance is underwritten by American Bankers Insurance Company of Florida or its affiliates. The description herein is a summary and intended for informational purposes only and does not include all terms, conditions and exclusions of the policies described. Please refer to the actual policies for terms, conditions and exclusions of coverage. Coverage may not be available in all jurisdictions.